Tuesday, March 12, 2013 - 7:45 a.m. to 1:30 p.m. 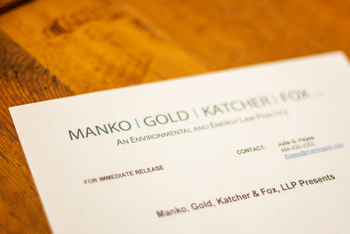 Founding Partner Joseph M. Manko and partner Michael M. Meloy of Manko, Gold, Katcher & Fox, LLP, the environmental, energy and land use law and litigation firm based in Bala Cynwyd, PA, will participate in the Delaware Valley Green Building Council’s (DVGBCs) 3rd Annual PA/NJ Sustainability Symposium on Tuesday, March 12, 2013. MGKF is also a Talon Sponsor of the event and a Sustaining Sponsor of the DVGBC.